Colonial Williamsburg, in Williamsburg, Virginia, offers a look back at historic America in the 17th and 18th centuries. The colonial town was once the capital of Virginia and has been restored to its original elegance. It is a popular tourist attraction, especially during the holiday season. Many Colonial Williamsburg design elements are repeated throughout the South. Williamsburg, originally called Middle Plantation, was founded in 1632 as the original Jamestown settlers looked for higher and drier ground. The colony became the capital of Virginia in 1699 and was renamed Williamsburg after England's King William III. According to the official site of Colonial Williamsburg, the city was home to some of the early colonies' greatest statesmen, including Patrick Henry, George Washington, and Thomas Jefferson. The town fell into disrepair after the American Revolution, when Virginia's capital was moved to Richmond. In the early 20th century, industrialist John D. Rockefeller Jr. set out to restore the many authentic buildings as a living history museum. You can read more about Williamsburg's restoration in Mark R. Wenger's article on the subject. 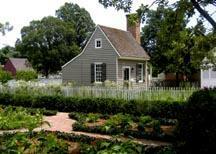 Colonial Williamsburg style combines English traditional design with the bounty and openness of the new world. Furniture largely retained its European lines, however, it was constructed from America's abundant oak and cherry wood instead of European pine. Often, American accents such as eagles or acorns found their way on furniture and accessories, creating truly American design. Typical colors in Willamsburg design represent the colors of the Chesapeake basin, including hunter green, soft robin's egg blue and a variety of neutral colors ranging from soft ecru to a rich wheat color. Wallpapers traditionally are stamped in an intricate, repeating patterns. Accents include carved fruit and nuts, animals, and brass finials. Crickets, a British symbol of good luck, are often found in cast-iron or brass. Architectural details such as dental mouldings and massive hearths are common. Accessories include European luxury goods such as crystal and china. American crafts such as quilts, pewter items, and handwoven textiles are seen throughout the community. Brass accessories such as lamps, chandeliers, snuff boxes and tableware are also typical. The holidays at Williamsburg are a magical time. 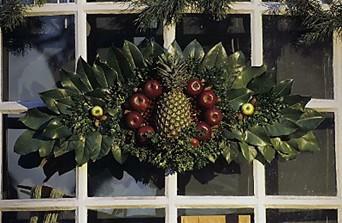 Typical decorations include the famous "Colonial Williamsburg door decorations," which display dried herbs, vegetables and fruit, such as apples and oranges and pine cones. According to authors Mary Miley Theobald and Libbey H. Oliver, in an article appearing in the 1996-97 edition of the Williamsburg Journal, this tradition did not begin in the 18th century, as people would have been thought to be crazy for leaving food outdoors to rot or be eaten by birds. This tradition actually started in the early 20th century and was influenced by Italian carvings from the Renaissance era. Handmade decorations using natural materials such as pine boughs, holly berries, seed pods, pine cones, magnolia leaves and oyster shells are popular in this historic community. Colonial Williamsburg is open 365 days a year and makes a fascinating living history and design lesson for visitors of all ages. Located just south of the Chesapeake Bay, about an hour drive from Richmond, Virginia, Williamsburg is easily accessible from cities along the East Coast. 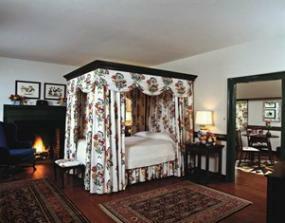 Accommodations vary from the classic and luxurious Williamsburg Inn to the family-oriented Williamsburg Lodge. Visitors can even opt to stay in authentic colonial guest houses, scattered throughout the restored area. Attractions at Williamsburg include visiting the authentic 17th and 18th century crafts studio, dining in a traditional colonial pub or restaurant and seeing a reenactment of a colonial muster on the town green. To find special deals on Williamsburg vacation packages for summer, fall and the holidays, visit Colonial Williamsburg online. For group and guided tours, visit Colonial Williamsburg.com. Don't miss out on a great opportunity to experience America's colonial past in person!